We've included these beaches for you: Spiaggia del Fornillo and Baia di Ieranto. Step out of the city life by going to Villa di Pollio Felice - Bagni della Regina Giovanna and Vulcano Solfatara. Explore Sorrento's surroundings by going to Archaeological Museum of Paestum (in Paestum), Gaeta (Spiaggia di Serapo & Montagna Spaccata), Duomo di Salerno (in Salerno) and Villa dei Misteri (in Pompeii). There's still lots to do: enjoy the sand and surf at Marina di Puolo, contemplate in the serene atmosphere at St Francis Church and Convent, take in the architecture and atmosphere at Cattedrale di Sorrento, and take in the waterfront at Marina Grande - Antico Borgo Marinaro. 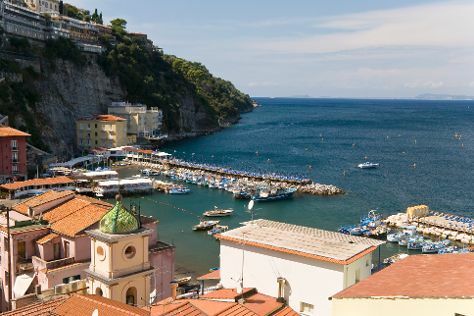 For ratings, where to stay, maps, and other tourist information, read our Sorrento travel guide. Use the Route module to find suitable travel options from Pasadena, USA to Sorrento. You'll lose 7 hours traveling from Pasadena to Sorrento due to the time zone difference. Expect slightly colder weather when traveling from Pasadena in July: highs in Sorrento hover around 88°F, while lows dip to 73°F. Finish up your sightseeing early on the 26th (Tue) so you can travel back home.